With the mid-afternoon call for prayer echoing ringing around the Amman valley, I took delivery of my first trading card purchases in just under three years. After giving it some thought, I had recently decided that whilst I would pick-up some of the existing chases that I had put on hold for a few years, I also wanted to add some recently issued cards to my collection. I have always enjoyed picked up cards of active players and there are a whole raft of NBA players that I do not own cards of. 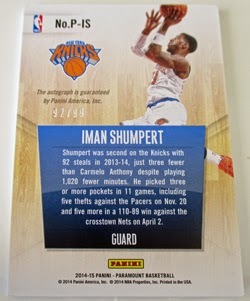 Preferring own complete (be it base or insert) sets, as opposed to purchasing random cards; this meant picking a new chase set or two from the 2014-15 Panini releases. 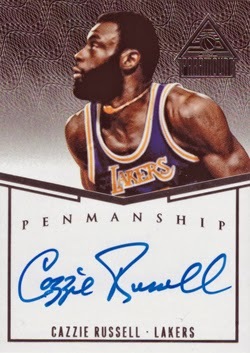 After a bit of research, for the first chase, I settled on the 2014-15 Panini Paramount Penmanship insert set. — As a recently released set, singles are readily available to purchase on eBay. — It is a sticker & memorabilia free autograph only set. 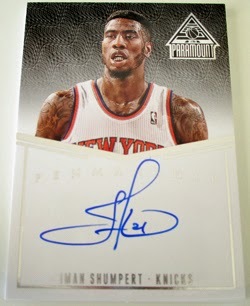 As I have previously stated, I am not a fan of memorabilia cards and can not abide sticker autograph cards. — The design is a clear and simple one and not a million miles from the 2007-09 Ultimate Collection Signatures set that I already own. — Finally, the 71 card set contains a good selection of current all-stars and rookies; alongside a number of cards from retired players. Most at a price point that suit my budget. Consequently, the cards that arrived today all come from the above set. 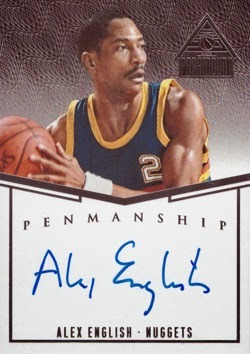 In addition to the three cards show of Iman Shumpert (now featuring in the playoffs for the Cavaliers) and HOF legends Alex English & Cazzie Russell, were a few others that I will blog about over the coming days.